After strawberries come plums… already? For the past week we’ve been eating plums for dessert almost every day. It’s come as a bit of a surprise to this urban person! The label said “harvest in August” and yet I found myself wondering why a couple of plums had dropped from the tree at the start of July. After rescuing a couple from the gentle critters that would have cleaned the fruits up – woodlouse in English, they also tend to eat strawberries when they can get at them in wet weather, and slugs – I washed them, cut them open to check the inside, smelled them, and ate them. Wow. They’re ripe – over a month before they were ‘supposed to be’. So out I went with any kind of bowl or pot I happened to have. And picked about fifteen plums. And told my husband, and put our son in his bed. When I came downstairs said husband had picked another dozen. After having gained that little bit of knowledge about strawberries “strawberries don’t ripen after they’re picked”, apparently, I was a bit alarmed by the fact that some of the plums looked decidedly unripe. 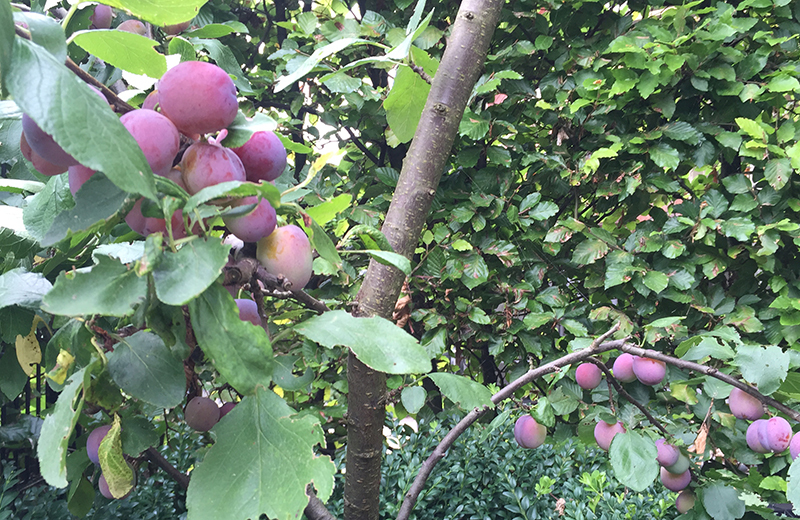 I needn’t have worried – plums do ripen rather well if the temperature is high. Which was probably what had led to our early harvest. Do you happen to have a good recipe for plum pie? So we’ve eaten a big bowl of plums by now and I know that for next year I really want a good recipe for plum pie. I’ve had some wonderful pies in Germany over the years. The cherry pie I once decided would make a great lunch (cherry layer: two inches) wasn’t bad either! But I don’t think we have room for a cherry tree as well. Oh well. For now we’ll just have to munch our way through our harvest. So far we’ve combined plums with strawberries (from the shop, unfortunately – ours have run out), and yoghurt. I think they’ll be great with banana. All in all we have been having more fruit than usual. And that’s our first harvest from the plum tree! There’s still some fruit on the tree and there must be around twenty plums on the ground and in the box hedge near it. They’re already half-eaten, so I’ll leave them where they are expecting that the nutrients will end up back in the soil at some point. P.S. Looks like the peas want harvesting. Investigate tomorrow. I hope. Unless we get another month’s worth of rain pouring down – again.